View More In Solid Feeding. Make Any Cup A Sippy Cup With Healthy Sprouts 5 Pack Silicone Sippy Cup Lids! Tired of dealing with a kitchen drawer stuffed full of lids and nozzles that never seem to match? Or sippie cups with small parts that attract black gunk you can't quite identify, but just KNOW can't be good for your kids? Do you find yourself flagging down the waiter to clean up that drink your little one spilt all over the table? Or tired of having to haul around what feels like 50 pounds slung over your shoulder on family days out?! If the above sounds familiar then our non spill sippy cup lids are the solution you've been looking for! New improved design based on customer feedback, designed to easily put on with highest grade silicone for maximum durability. 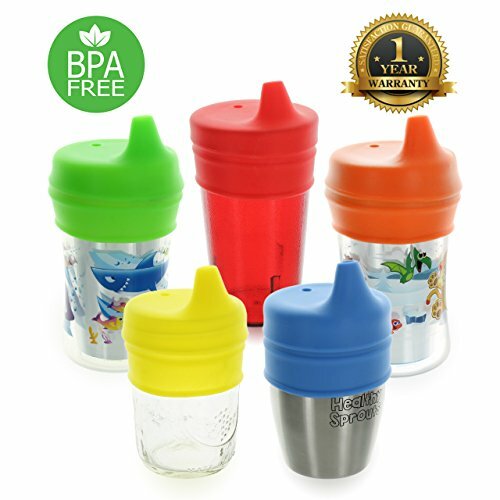 We guarantee once you've tried our sippy lids for infant and toddler drinking cups you won't be able to live without them! Please note, given the firm silicone rim seal, some cup brands may cause occasional lid tears when using rimless style stainless steel cups like Caveman Kids and TeamFar, or wide-mouthed plastic cups like IKEA Kalas tumblers and Nuby Fun Drinking Cups, . If you have any questions about this product by Healthy Sprouts, contact us by completing and submitting the form below. If you are looking for a specif part number, please include it with your message.